One of the world's foremost authorities on the subject of suicide terrorism, the esteemed political scientist Robert Pape has created the first comprehensive database of every suicide terrorist attack in the world from 1980 until today. 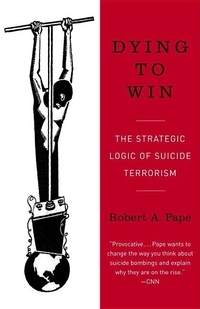 In Dying to Win, Pape provides a groundbreaking demographic profile of modern suicide terrorist attackers-and his findings offer a powerful counterpoint to what we now accept as conventional wisdom on the topic. He also examines the early practitioners of this guerrilla tactic, including the ancient Jewish Zealots, who in A.D. 66 wished to liberate themselves from Roman occupation; the Ismaili Assassins, a Shi'ite Muslim sect in northern Iran in the eleventh and twelfth centuries; World War II's Japanese kamikaze pilots, three thousand of whom crashed into U.S. naval vessels; and the Tamil Tigers in Sri Lanka, a secular, Marxist-Leninist organization responsible for more suicide terrorist attacks than any other group in history. "Invaluable . . . gives Americans an urgently needed basis for devising a strategy to defeat Osama bin Laden and other Islamist militants." "Provocative . . . Pape wants to change the way you think about suicide bombings and explain why they are on the rise." "Enlightening . . . sheds interesting light on a phenomenon often mistakenly believed to be restricted to the Middle East." -Peter Bergen, author of Holy War, Inc.